Multinational oral care brand Pepsodent will educate 10 million children on practicing brushing teeth twitch a day as part of efforts to promote oral hygiene in Bangladesh. 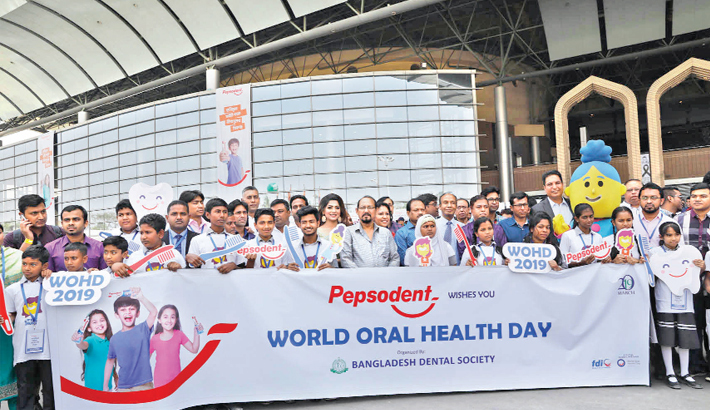 Pepsodent shared the planning at an observation prorgamme of World Oral Health Day at Bangabandhu International Conference Centre in the capital on Wednesday. FDI-World Dental Federation declared the March 20 as World Oral Health Day in 2013 to raise voice of dentistry, promote oral health for everyone, science and practice of dentistry. Unilever Bangladesh organised the daylong porgamme under its flagship brand of Pepsodent in association with Bangladesh Dental Society (BDS) reiterating the importance of building a cavity-free Bangladesh. Over 3000 dentists participated in the event featuring a host of activities which included the launch of toothpaste named ‘Sensitive Expert by Pepsodent’. This new range promises to reduce sensitivity in just 30 seconds and prevents it from coming back. Pepsodent also showcased the work it has done with Bangladesh Dental Society in creating healthy smile in schools across Bangladesh through school programs. A major feature of the event was a brushing session with the kids, teaching them the right brushing technique and encouraging them to not miss out on twice a day brushing. Addressing the event, Unilever Bangladesh Personal Care Director Nafees Anwar emphasized on being aware of the uncertified dentists. He reiterated the importance of all certified dentists working in alliance with Unilever, to make sure everyone can identify the certified dentists in their community and safeguard their oral health. The officials also focused on raising awareness on the importance of twice a day brushing, with a set of initiatives which drives behavioral changes and thereby reducing the chance of tooth decay.